An IT Technical Support professional monitors and maintains the systems and networks in an organization. 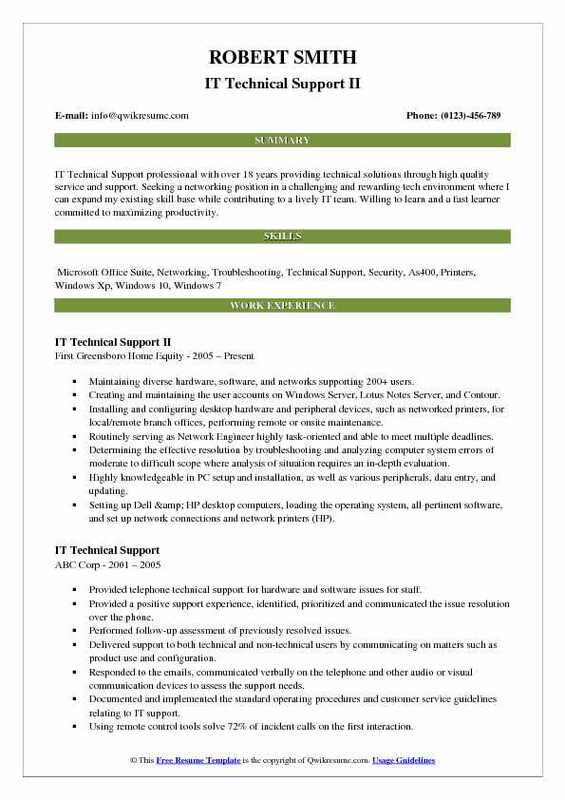 Some of the roles and responsibilities that can be found commonly on the IT Technical Support Resume – to install and configure computer systems, diagnose any hardware and software issues, and resolve any technical or applications glitches through phone or email, and shoulder all other responsibilities as assigned by the IT Department of the organization. 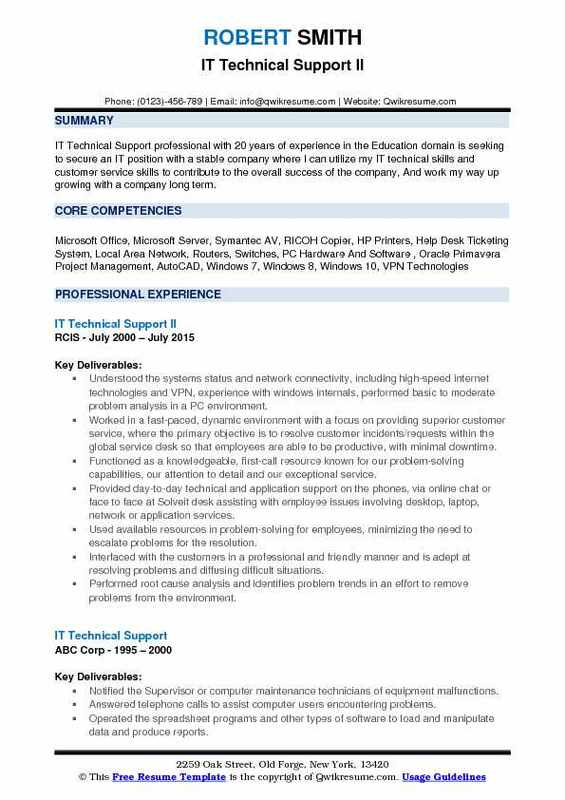 To become a successful IT Tech Support professional, you must possess the following technical qualifications: advanced knowledge hardware and software, staying up to date about trends in information and network security, knowledge about basic electricity and computer wirings. The education expected for the role is at least a diploma in Computer Science or other relevant fields with few years of relevant experience. Providing support to end users on a variety of issues. Identifying, researching, and resolving the technical problems. Responding to telephone calls, email and personnel requests for technical support. Troubleshooting problems across both Windows and Mac operating system and applications. Documenting, tracking and monitoring the problem to ensure a timely resolution. Relying on instructions and pre-established guidelines to perform the functions of the job. Providing technical assistance and support for incoming queries and issues related to computer systems, software, and hardware. Resolving technical problems with Local Area Networks (LAN), Wide area Networks (WAN), and other systems. Networking firewalls implementation of a WAN (Wide Area Network) including all our stores based on a networking VPN, establishing a secure connection between the main datacenter, the corporate office and mobile users,. Networking CA/Load Balancer Management of digital certificates for encrypted communications. 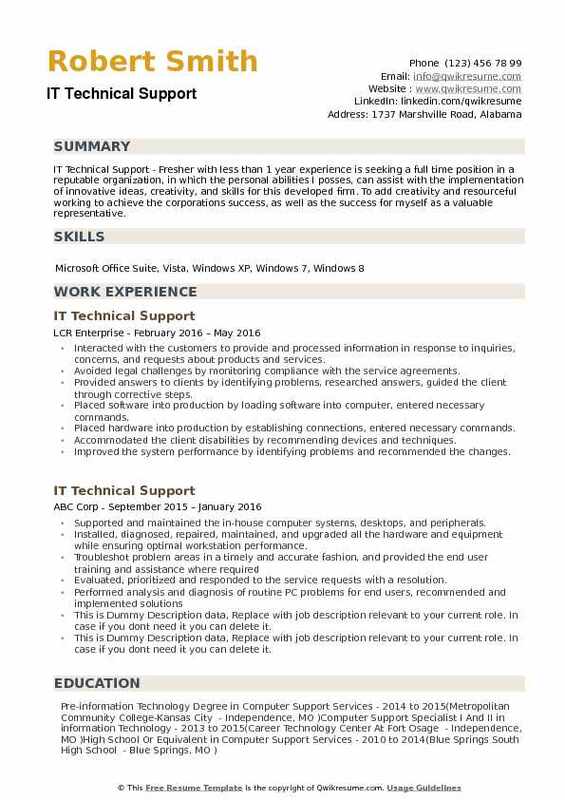 Summary : IT Technical Support professional with 20 years of experience in the Education domain is seeking to secure an IT position with a stable company where I can utilize my IT technical skills and customer service skills to contribute to the overall success of the company, And work my way up growing with a company long term. Understood the systems status and network connectivity, including high-speed internet technologies and VPN, experience with windows internals, performed basic to moderate problem analysis in a PC environment. Worked in a fast-paced, dynamic environment with a focus on providing superior customer service, where the primary objective is to resolve customer incidents/requests within the global service desk so that employees are able to be productive, with minimal downtime. Functioned as a knowledgeable, first-call resource known for our problem-solving capabilities, our attention to detail and our exceptional service. Provided day-to-day technical and application support on the phones, via online chat or face to face at Solveit desk assisting with employee issues involving desktop, laptop, network or application services. Used available resources in problem-solving for employees, minimizing the need to escalate problems for the resolution. Interfaced with the customers in a professional and friendly manner and is adept at resolving problems and diffusing difficult situations. Performed root cause analysis and identifies problem trends in an effort to remove problems from the environment. Summary : IT Technical Support professional with over 18 years providing technical solutions through high quality service and support. Seeking a networking position in a challenging and rewarding tech environment where I can expand my existing skill base while contributing to a lively IT team. Willing to learn and a fast learner committed to maximizing productivity. Maintaining diverse hardware, software, and networks supporting 200+ users. Creating and maintaining the user accounts on Windows Server, Lotus Notes Server, and Contour. Installing and configuring desktop hardware and peripheral devices, such as networked printers, for local/remote branch offices, performing remote or onsite maintenance. Routinely serving as Network Engineer highly task-oriented and able to meet multiple deadlines. Determining the effective resolution by troubleshooting and analyzing computer system errors of moderate to difficult scope where analysis of situation requires an in-depth evaluation. Highly knowledgeable in PC setup and installation, as well as various peripherals, data entry, and updating. Setting up Dell & HP desktop computers, loading the operating system, all pertinent software, and set up network connections and network printers (HP). Utilizing the DOS mode to reset and restore corrupt systems, lost connections, etc. Cleared the equipment at end of operating run and reviewing schedule to determine the next assignment. 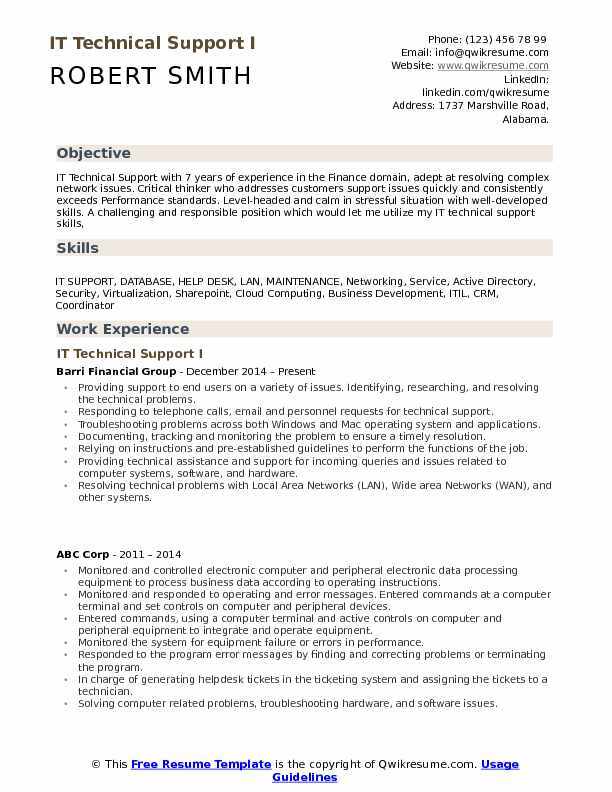 Objective : Junior IT Technical Support with 4 years of experience is seeking to secure a position with a well-established and stable organization that will lead to a lasting work relationship while contributing my experience and skills proven by years of successful career. Provided in-depth software hardware and network support for incidents and requests that were received on the help desk. Reviewed, prioritized, documented, followed up and solved customers service requests in person and using remote technologies. Worked together with the Network and Server Administrators to initiate and solve complex technical issues and escalate them accordingly. Performed fix at the desktop level, including installing and upgrading software and configuring systems and application. Performed analysis, diagnosis, and resolution of complex printers, scanners and multifunctional devices problems for a variety of end users, recommend and implement corrective hardware solutions. Tested fixes and perform post-resolution follow-ups to ensure problems have been adequately resolved. Collaborated with other members of the IT team to analyze and respond to technical problems and participated in the cross-training sessions. Communicated the software problems and issues to software development and support teams. Recorded, tracked, and documented the service desk request problem-solving process through to final. Summary : Enthusiastic IT Professional seeking to benefit an IT Department with advanced and up to date techniques in an energetic, fast growing and demanding environment. Exposed to diverse business environments ranging from small and medium enterprises to large organization, warehouses, nongovernmental organization, and banks. Identified and solved the issue using a variety of methods including WebEx, web interface, telephone, and email conversations. Provided Business to Business (B2B) technical support for the customers in roles such as IT Directors and System/Network administrators. Answered tickets submitted by the Client organization regarding issues on software such as Windows, Active Directory, Microsoft Exchange, etc. Provided superior customer management inclusive of excellent communications, responsive follow through, and advocacy for customer issues within internal departments. Collaborated extensively with peers, Program Team, Account Managers, and members of the escalation team to resolve customer issues while actively contributing to a growing knowledge network that improved the effectiveness of our team and the information available for our customers. Troubleshoot, diagnosed, and resolved problems related to operating systems, hardware, and software. 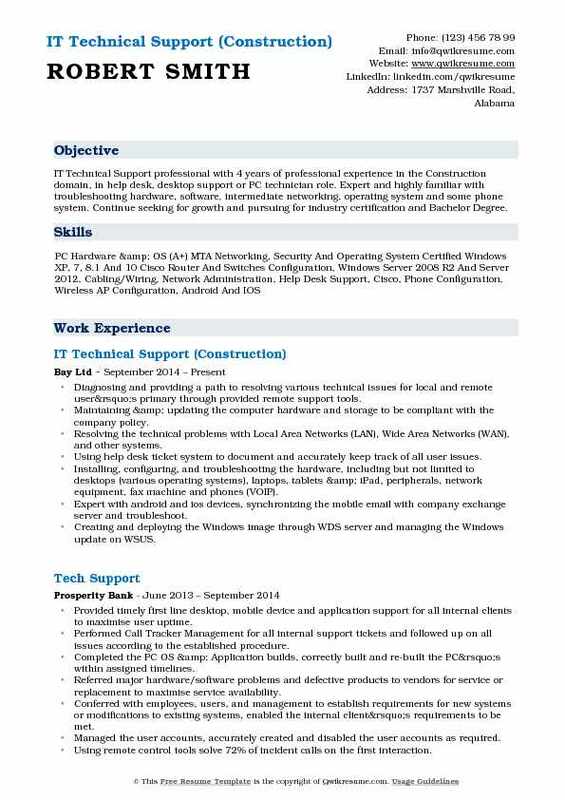 Objective : IT Technical Support professional with 4 years of professional experience in the Construction domain, in help desk, desktop support or PC technician role. Expert and highly familiar with troubleshooting hardware, software, intermediate networking, operating system and some phone system. Continue seeking for growth and pursuing for industry certification and Bachelor Degree. Diagnosing and providing a path to resolving various technical issues for local and remote user’s primary through provided remote support tools. Maintaining & updating the computer hardware and storage to be compliant with the company policy. Resolving the technical problems with Local Area Networks (LAN), Wide Area Networks (WAN), and other systems. Using help desk ticket system to document and accurately keep track of all user issues. Installing, configuring, and troubleshooting the hardware, including but not limited to desktops (various operating systems), laptops, tablets & iPad, peripherals, network equipment, fax machine and phones (VOIP). Expert with android and ios devices, synchronizing the mobile email with company exchange server and troubleshoot. Creating and deploying the Windows image through WDS server and managing the Windows update on WSUS. Managing the active directory organization units (users and computers, distribution lists). Managing the Symantec AV Server, VPN, Microsoft Lync, DHCP, Exchange and 2X (parallels remote application server). Troubleshooting the printers and copier issues (Ricoh, Xerox, Brother and HP). 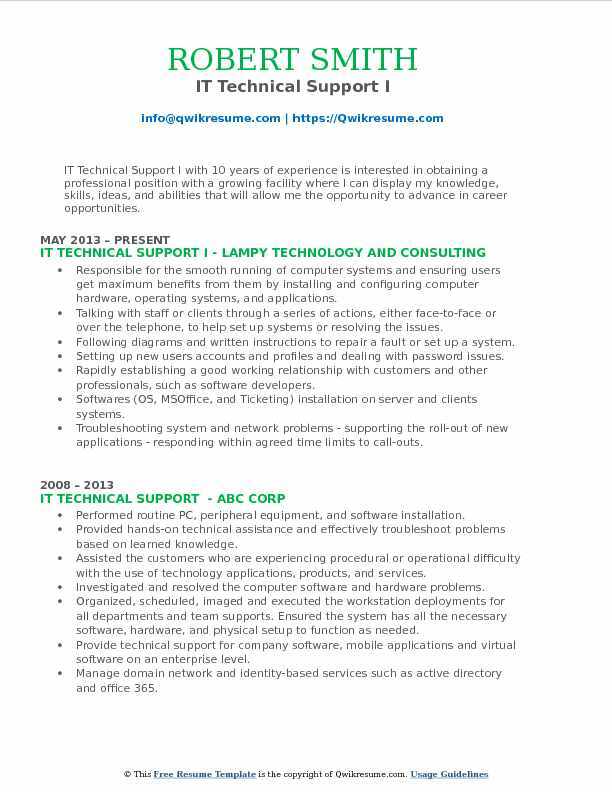 Summary : IT Technical Support I with 10 years of experience is interested in obtaining a professional position with a growing facility where I can display my knowledge, skills, ideas, and abilities that will allow me the opportunity to advance in career opportunities. Responsible for the smooth running of computer systems and ensuring users get maximum benefits from them by installing and configuring computer hardware, operating systems, and applications. Talking with staff or clients through a series of actions, either face-to-face or over the telephone, to help set up systems or resolving the issues. Setting up new users accounts and profiles and dealing with password issues. Softwares (OS, MSOffice, and Ticketing) installation on server and clients systems. Troubleshooting system and network problems - supporting the roll-out of new applications - responding within agreed time limits to call-outs. 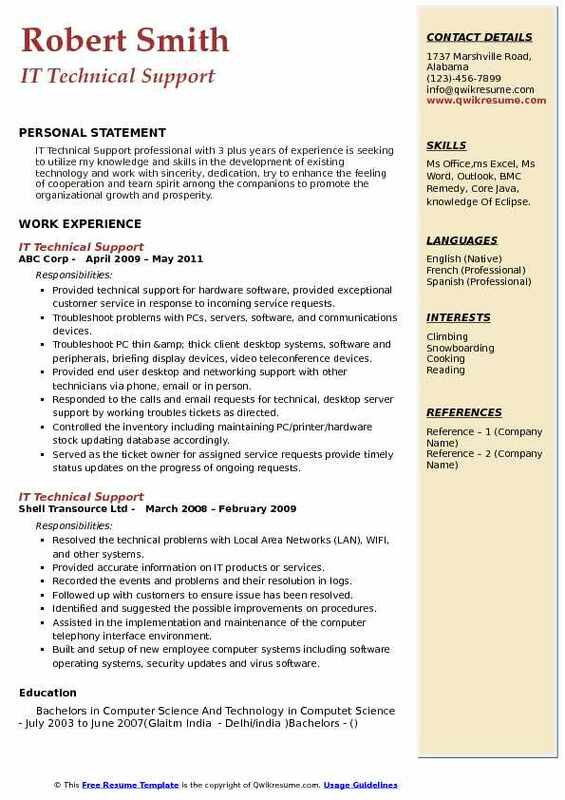 Headline : Highly motivated Information Technology graduate who is looking for an IT Tech Support job where I can use my expertise and knowledge. 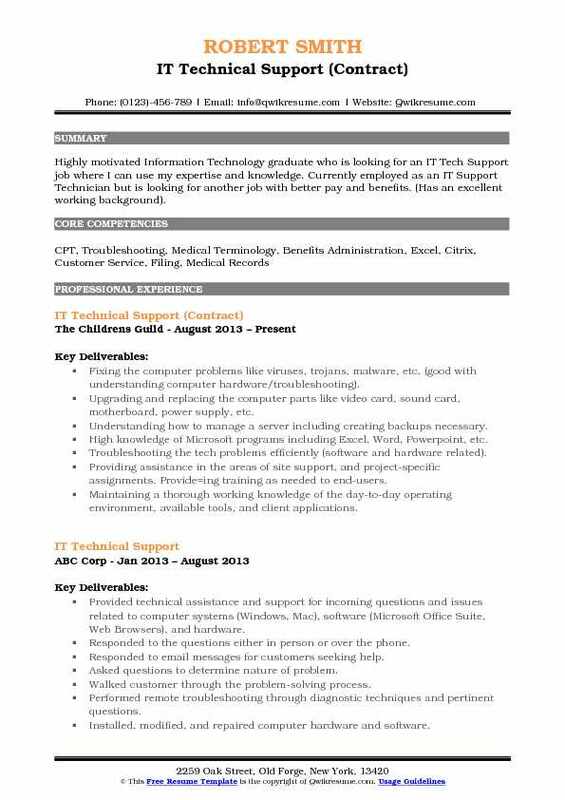 Currently employed as an IT Support Technician but is looking for another job with better pay and benefits. (Has an excellent working background). Fixing the computer problems like viruses, trojans, malware, etc. (good with understanding computer hardware/troubleshooting). Upgrading and replacing the computer parts like video card, sound card, motherboard, power supply, etc. Understanding how to manage a server including creating backups necessary. High knowledge of Microsoft programs including Excel, Word, Powerpoint, etc. Troubleshooting the tech problems efficiently (software and hardware related). Providing assistance in the areas of site support, and project-specific assignments. Provide=ing training as needed to end-users. Maintaining a thorough working knowledge of the day-to-day operating environment, available tools, and client applications. Maintaining a working knowledge of service desk and IT operations procedures related to the client services. Providing management with information on problems that are severe in nature or that are exceeding target dates. 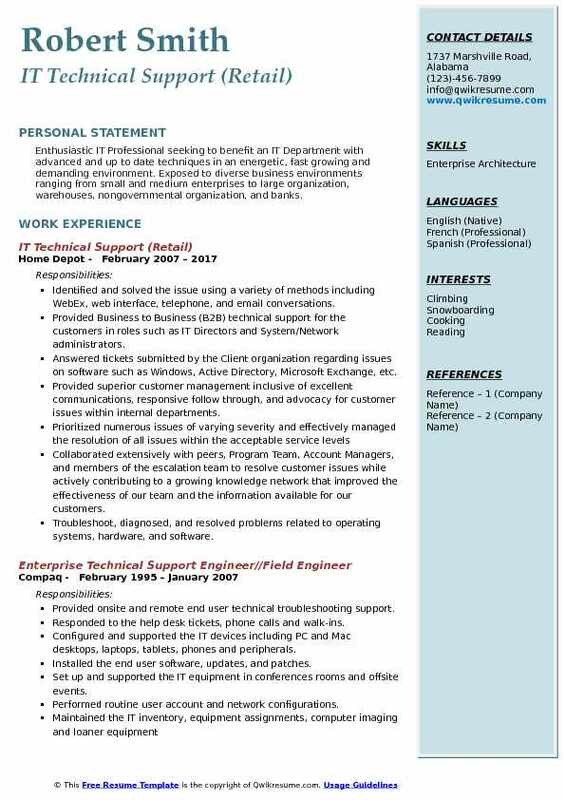 Objective : IT Technical Support professional with 3 plus years of experience is seeking to utilize my knowledge and skills in the development of existing technology and work with sincerity, dedication, try to enhance the feeling of cooperation and team spirit among the companions to promote the organizational growth and prosperity. Skills : Ms Office,ms Excel, Ms Word, Outlook, BMC Remedy, Core Java, knowledge Of Eclipse. Provided technical support for hardware software, provided exceptional customer service in response to incoming service requests. Troubleshoot problems with PCs, servers, software, and communications devices. Troubleshoot PC thin & thick client desktop systems, software and peripherals, briefing display devices, video teleconference devices. Provided end user desktop and networking support with other technicians via phone, email or in person. Responded to the calls and email requests for technical, desktop server support by working troubles tickets as directed. Controlled the inventory including maintaining PC/printer/hardware stock updating database accordingly. Served as the ticket owner for assigned service requests provide timely status updates on the progress of ongoing requests. Adhered to the established IT policies, procedures and standards and ensured the conformance with information systems goals and procedures. Analyzed the data points from monitoring tools and reporting systems to determine the root cause of a problem and performed the necessary functions to resolve the problem. 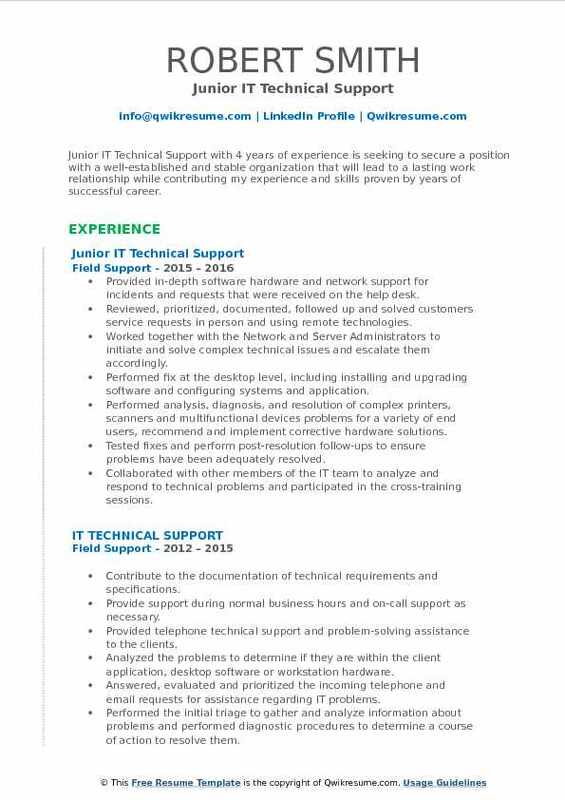 Objective : IT Technical Support - Fresher with less than 1 year experience is seeking a full time position in a reputable organization, in which the personal abilities I posses, can assist with the implementation of innovative ideas, creativity, and skills for this developed firm. To add creativity and resourceful working to achieve the corporations success, as well as the success for myself as a valuable representative. Interacted with the customers to provide and processed information in response to inquiries, concerns, and requests about products and services. Avoided legal challenges by monitoring compliance with the service agreements. Provided answers to clients by identifying problems, researched answers, guided the client through corrective steps. Placed software into production by loading software into computer, entered necessary commands. Placed hardware into production by establishing connections, entered necessary commands. Accommodated the client disabilities by recommending devices and techniques. Improved the system performance by identifying problems and recommended the changes. Maximized the use of hardware and software by training users, interpreted instructions and answered the questions. Maintained client confidence and protected the operations by keeping the information confidential.